Darién National Park is a protected tropical rainforest in southernmost Panama that forms a bridge between two continents. A stretch of Pacific Coast with beaches, mangroves and swamps also belongs to the designated area. The park's fauna is rich and diverse, but still relatively unknown because of its relative inaccessibility. The most common species include avifauna such as macaw and parrot. The harpy eagle also calls this national park home, it is the world's largest population of this species. Tapir and capybara are among the frequently seen mammals. Two major indigenous groups, the Chocó and Kuna Indians, are still living by traditional practices within the park. Finally visited in November 2017. Quite difficult to reach but doable with some preparation. Of course it is not the place you can go on your own. There are number of dangers that are real (smugglers, narcotraffickers, guerillas, paramilitares), presence of many armed representatives of Panamanian police (Senafront) only acknowledge that. But all the efforts and difficulties are rewarded with what you finally see in Darien. Untouched rainforest, pristine rivers, diverse wildlife, endemic species –everything you will find there. With no doubt the most efficient (and expensive) way is to go there with an organized trip. There are several agencies specializing in making Darien tours. The majority of them offer multi-day trips with everything well organized (food, accommodation, transportation including stay within national park boundaries) but most of them avoid November as it is treated as wet period. Anyway searching before travel there I found several agencies that - despite rainy season – were eager to organize individual trips there but apart from costs they were stressing on staying more days in Darien (minimum 5 days altogether). If interested let me know and I will send details of what I found out. Knowing that I tried to organize trip for myself. Bus from Panama City Albrook Terminal to Meteti (9 USD per person) than changes to minivan Meteti – Yaviza (5 USD per person), if you start journey in the morning (Panama) you should arrive to Yaviza late afternoon. On a way there are 2 check-points – all tourists are registered (you should name all the destinations that are planned to be visited) but no permits are required at this time. Depending on your arrival time to Yaviza you can try to arrange necessary permits and documents the same day (or the following), there is very descent hostel close to Yaviza port as well as reasonably priced restaurants. 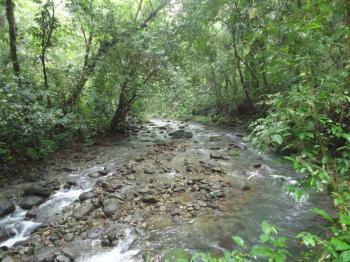 Darien National Park office is located nearby some 600 m from the centre (ask locals for Mi Ambiente oficina). To receive permit for Darien National Park it is necessary to have a guide (local or official one) as his name is stated in the permit. If you don’t have a guide usually the park officials may help in finding someone but you should negotiate the price first (usually depends on places to be seen and days spend in Darien). Permit costs 5 USD per person and includes places to be visited / days spend within the boundaries of Darien National Park and guide name. At the park office you can also pay your accommodation fee – 15 USD per person / per day. I was lucky to have a official National Park guide - local person, speaks good English (and Spanish of course) with good knowlege of local fauna, plants and area, I can recommend him - if interested let me know so I can send contact details. Once you get permit you should check at local police station (Senafront, located close to National Park office). This is usually done by your guide. After that you can try to arrange next steps – food and all the meals for stay in the Park (there are good shops near the port). Buy everything what you will need at this point. Afterwards you should organize a boat from Yaviza to El Real. Fee for foreign tourist is 10 USD per person (one way) – locals pay half of this price (e.g your guide) but you are a foreign tourist. The trip to El Real usually takes around 40 minutes. In El Real there are 2 more check-points (one just close to the port, another one in the village centre) where your documents are carefully viewed but usually that does not take much time. From El Real there is an unsealed road to Pijibasal Indian Village (15 km). Officially there is a public transport (4x4WD, 2 USD per person, one way) but foreign tourists pay full price per car (25 - 30 USD, one way, sometimes it is more, depending on your negotiation skills). It can also be taken by foot but after 5-6 km there is a big river (I haven’t noticed any bridge nor any place that can be passed by pedestrian) good enough for a car but difficult for a hiker. 4x4 goes to Pijibasal but you get off some 500 m before the village where the path to Rancho Frio in Darien National park begins. That part can be done only on foot. The track is well marked but during rainy season it can be difficult to walk (huge mud and occasional streams). Although it is around 3 km it took around 1,5 hours to reached Park border (there are signposts) and around 2 hours to get to Rancho Frio which is located inside Darien National Park. Rancho Frio is more a ranger station than a campground. Tourist facilities are very basic (including kitchen – gas or stove, some cutlery, plates, pots, one toilet, one shower (but don’t count on hot water as it is taken from a nearby river) and a place to sleep (separate building with bunk beds) – you should have your own bedding and mosquito net. 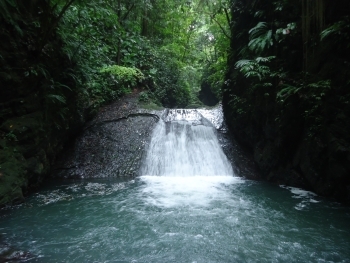 There is a nice trek around Rancho Frio (2-3 hours) but visit to local Perresenico waterfall requires at least 200 meters to go inside the stream – be prepared for that as nothing dries in Darien due to high humidity. Anyway even if it looks as marked I would not dare to go without a guide due to occasional landslides or fallen trees. During night you should have a torch as there is light only at rangers place (generator that works only if there is enough petrol, but usually not after 9.00 – 10.00 PM). Mind that you are in the middle of a jungle and any light in the night attracts plenty of insects. On a way back it is possible to visit Pijibasal local Indian Wounaan community – it is also possible to spend a night there – there is a hostel in the centre of the village – sleep in hammocks – and explore area towards Dos Bocas (3 hours trek to Dos Bocas waterfall). From Pijibasal there is well known transport to El Real, same prices as previously stated, El Real – Yaviza part is done exactly the same – it is advised to reach El Real sufficiently early because in the afternoon there could be no boats to Yaviza (you will be forced to spend the night in El Real – not recommended by Lonely Planet). Natural sites with indigenous human population: Choco and Kuna Indians still inhabit the park. Gold production: "An important bird watching site is located in the Cana Scientific Station in the centre of the park where there was once the Espiritu Santo Gold Mine (opened as a gold mine by the Spanish, the Cana mine produced gold continuously until 1727. This mine was later reopened by the Darien Gold Mining Company and operated until 1907, producing about 4 tons of gold)."